Working memory is a key component of perceptual and cognitive tasks. Traditional models of working memory in psychological research assume a fixed memory capacity whereby only a limited number of items (e.g. 4; Cowan, 2001) can be stored in discrete memory slots. 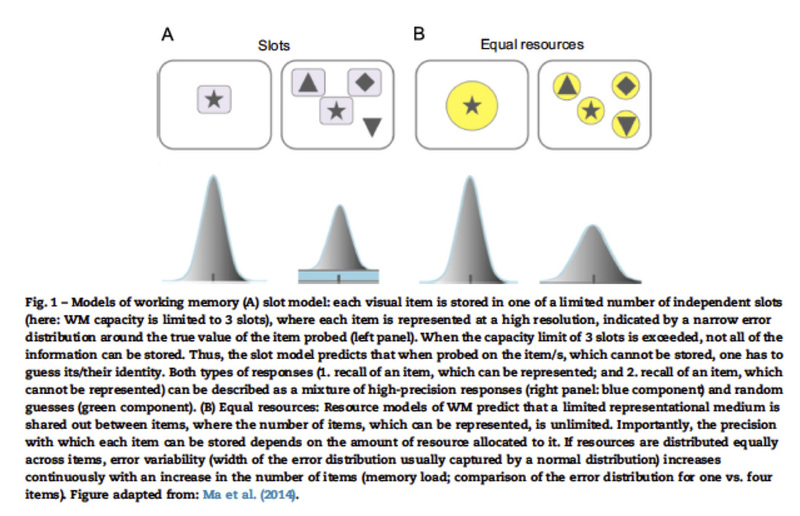 More recent models propose a different view and suggest that working memory resources are not limited but can be dynamically allocated according to the number of items to be encoded (cf. Bays and Husain, 2008). This view suggests that the precision with which items are encoded in working memory decreases as the number of items to be encoded increases (see figure below). In collaboration with Masud Husain and colleagues, we tested this model for representation of acoustic features like pitch in working memory (Kumar et al., 2013). We found that representation of pitch in working memory is consistent with the predictions of the shared resource model of working memory, thereby suggesting common principles of memory encoding for visual as well as auditory features (reviewed in Joseph et al., 2016). To examine whether memory representation of time intervals in rhythmic sound sequences (Teki & Griffiths, 2014) follows the shared resource model, I designed a novel behavioral paradigm to test working memory for a single time interval in the sound sequences with parameterized levels of temporal regularity and memory load (see figure below). iii) sequences associated with lower memory load, i.e. number of intervals. A follow-up functional magnetic resonance imaging study revealed the striatum and cerebellum as core brain regions that represent time intervals in working memory as a function of varying temporal regularity while the parietal cortex represented temporal memory as a function of memory load or number of intervals (Teki and Griffiths, 2016). Resource allocation and prioritization in auditory working memory. Working memory for time intervals in auditory rhythmic sequences. Brain bases of working memory for time intervals in rhythmic sequences.